One of the most sought after painters of the Western Desert, Willy Tjungurrayi is a senior Pintupi man, entitled by his ancestry and communal position to paint the sacred and secret Tingari cycle. He has been acknowledged as one of the great colourists of contemporary Aboriginal painting. Willy is the middle one of three brothers; Yala Yala Gibbs (founding member of the Papunya art movement and senior custodian of secret/sacred men business) was the eldest and George Ward Tjungurrayi the youngest. They were all sons of Pulpalpulpalnga Tjapaltjarri but had different mothers. Willy Tjungurrayi was born around 1932 at Patjantja, southwest of Lake Mackay in the Northern Territory. He came into Haast's Bluff in 1956 with other Pintupi people, and in 1959 Willy was trucked across to Papunya with most of the other Aboriginal residents due to problems with Haasts Bluff's water supply. 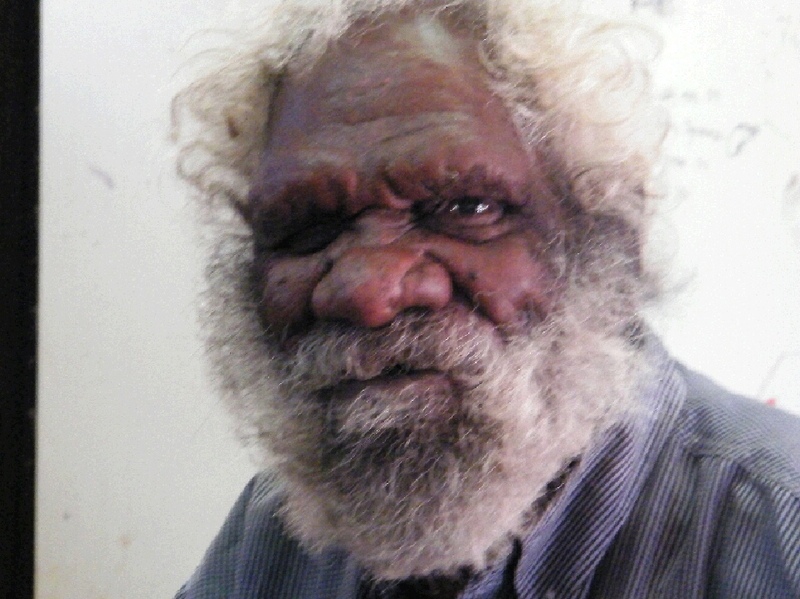 Willy began painting for Papunya Tula Artists in 1976. By the 1980s Willy was recognized as a senior Pintupi painter, and he joined the movement of return to the Pintupi homelands. He lived in Walungurru (Kintore) until 2003 and now splits his time between Alice Springs and Walungurru. Stories from the Tingari Dreaming song cycle, and the land around Haast's Bluff, Wilkinkarra (Lake Mackay) and Kaakuratintja (Lake MacDonald), are Willy Tjungarrayi's two great linked themes. For some subjects Willy paints dozens of dotted Roundels (concentric circles), linked by parallel lines, the spaces between them filled with bright, flat primary and mixed colours, a depiction of the travels and stopping places of the Tingari Men, an image of the rhythmic repetition of the songs associated with the Tjukurpa (Creation era or Dreaming). More recently, Tjungarrayi's paintings feature hundreds of endless wavy lines in an ochre monochrome shimmer across the canvas on a pale background. These paintings illustrate (or witness, might be more correct) the sand hills and the fierce hailstorm that killed the ancestral Tingari Men in the Dreamtime. Willy Tjungarrayi's work is highly sought after, and has been acquired for many major private and public collections. The Kelton Foundation, Santa Monica, U.S.A.
1991 The Painted Dream: Contemporary Aboriginal Paintings from the Tim and Vivien Johnson Collection, Auckland City Art Gallery and Te Whare Taonga o Aoteroa National Art Gallery, New Zealand. 1985 Dot and Circle, a retrospective survey of the Aboriginal acrylic paintings of Central Australia, Royal Melbourne Institute of Technology, Melbourne. 1983 Papunya: paintings from the Central Australian Desert, touring exhibition, America and Europe. 1982 Georges Gallery, Melbourne; Brisbane Festival; Mori Gallery, Sydney.